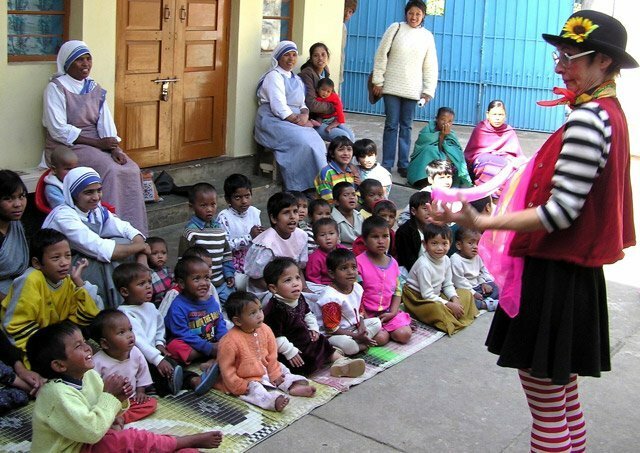 Magicians Without Borders, a 501C(3) organization, performs magic shows for children in refugee camps, orphanages and hospitals around the world -often in war torn places where love, laughter and magic are desperately needed. Magicians Without Borders began when Tom Verner, a professor of Psychology, was traveling through Eastern Europe in 2001 and did some magic shows in the refugee camps of Kosovo and Macedonia. The shows were so well received, that Tom decided to take a leave from his teaching and perform full time. Tom has set up a non-profit organization, Magicians Without Borders, to allow him to accept contributions to fund his work. 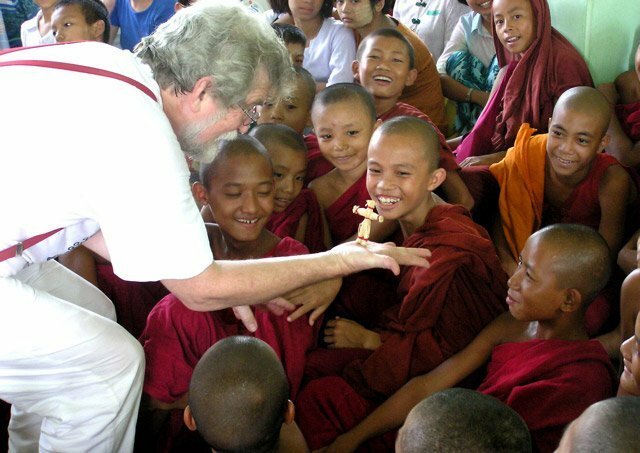 The trips would not have been possible without the support and contributions of generous individuals, corporations, organizations, friends and family. Since that first trip in 2001, Tom and his wife Janet, a visual artist and teacher, performing as a mime and clown in the shows, have taken six trips a year. They have traveled to Ethiopia numerous times, Sudan, Uganda, Tanzania, Somalia, India, Bangladesh, Macedonia, Kosovo, Serbia, Bosnia Croatia, Ukraine, Haiti and Colombia. They performed for a month in Thailand and Burma after the Tsunami.and traveled through Alabama, Mississippi and Louisiana after Hurcane Katrina. Tom and Janet, along with other magicians and theater teachers travel to El Salvador every three months where they perform for children in the countryside and are teaching magic and theater skills to a group of very poor teenagers. Magicians Without Borders sponsors a week long Magic, Theater and Art Camp for these chidlren who live in grinding poverty surrounded by brutal gang violence. These young magicians have already begun to perform in orphanages, hospitals and disaster areas in El Salvador. One day some of them may travel with Tom and Janet to bring magic and laughter to other poor chidlren in other parts of the world. At the invitation of the Unted Nations, Magicians Without Borders created a magic show that teaches childeren and adults about HIV/AIDS. They perform this educational and inspiring show in refuge camps around the world.